I really loved this book except for one big thing: the main character, Emma. Aside from her, I loved the sweet message about family this book sends, as well as the flowing writing style and gripping storyline. This book deals with a difficult subject: Emma's mother is brain-dead but still kept alive by machines since she's pregnant. Emma struggles with this fact throughout the book and is angry at her stepfather for not letting her mother die peacefully. I certainly felt sympathetic towards Emma's plight, and my heart broke for her multiple times, but at the same time I couldn't understand how Emma wouldn't want her baby brother to have a chance to live. Her stepdad sums it up perfectly when he say, "Your brother is fighting for his life, and you talk about him like he's not real." It would've been easier to like Emma if she was slightly more emotional. She's too selfish, and doesn't understand that her stepdad is grieving too. She was bitter and angry at him for far too long, but I did grow to like Emma eventually. This book was a very fast read for me, and yet it still manages to be full of depth. This is not an ordinary contemporary - it's raw and gritty. The minor characters really make this book - such as Emma's best friend, who refuses to use most electronics because her parents work in the electronic industry and are so busy they spend much of their time ignoring her. And Caleb, the love interest, is very sweet and I love the way he helps Emma learn to be happy again. Like her, he's suffered, and he understands her pain in a way that no one else does. I didn't completely love the romance for some reason, but it was a nice touch and never overtook the storyline. Although I had a hard time caring about Emma, I still enjoyed Heartbeat. It was a heartbreaking story that teaches the importance of family, and I liked Emma's journey from numbness and pain to slowly becoming part of the world again, or, as the summary says, "feeling her own heart beat again." 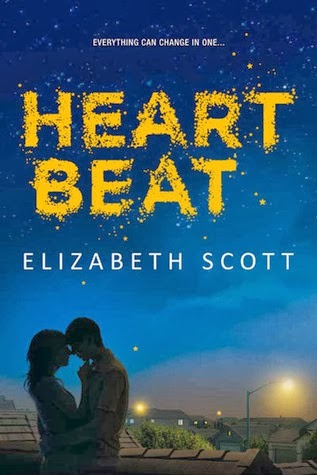 Heartbeat is a thoughtful contemporary story you won't want to miss out on. I agree with you about Emma! I kept waiting for the moment when I would finally connect with her, but it never came, and she seemed very whiny and childish to me. I knew she was going through a hard experience that I could never begin to understand, and I don't mean to criticize someone's method of dealing with her grief, but it seemed as if she wasn't even trying to work through it. I understand where Kirsty-Marie is coming from, though - I too would have been mad if my stepdad didn't even consult me about such an important issue. And I do think the author did a good job of portraying Emma's regret about putting so much time into her schoolwork. As a serious student, I related to that storyline and felt compelled to consider the ways I spend my time and what is really important. Anyway, I'm glad you enjoyed Heartbeat despite your problems with it, and I hope you enjoy any other books you end up reading by this author! Exactly! At first I thought that maybe the reason I couldn't connect with Emma is because I've never had to suffer an experience like that, but she did whine too much and treated her stepdad horribly. I'm totally with you on the schoolwork issue, too. I've always studied hard and that aspect of the story made me think as well. Thank you for stopping by and commenting, Emily!